The tab is divided into two parts. 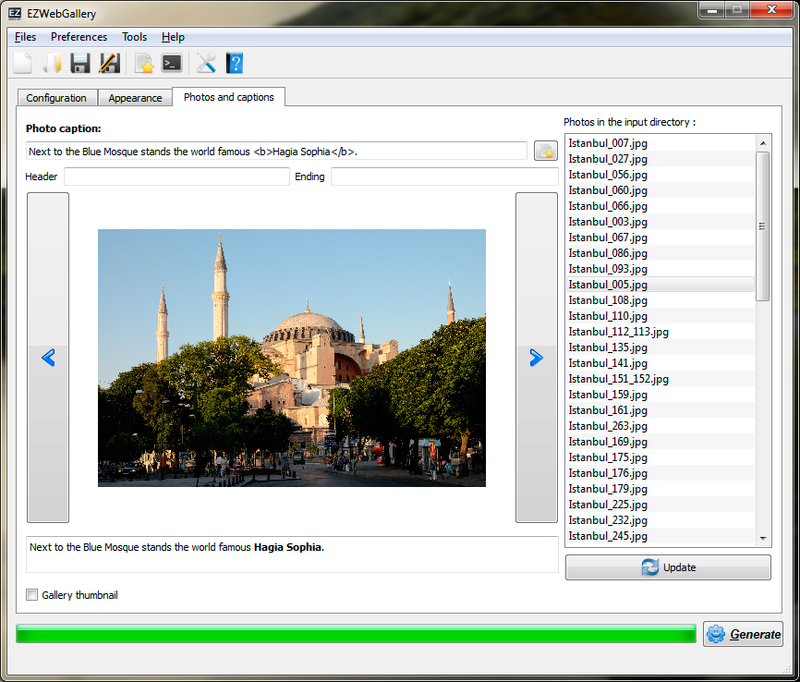 On the left, lies a visualization of the currently selected photo and fields to compose its associated caption. On the right, lies an ordered list of all the photos. The selected photo will be displayed in the center of the view. You can navigate by using the arrows or by clicking on a photo name listed on the right. Drag and drop the names to reorder the photos. If the content of the input directory changed, click on the Refresh button to update the list. If some photos are not available anymore, their associated caption will be discarded. The displayed photo can be elected as the Gallery thumbnail, which is used by various social network and search engines to preview the gallery. Three fields are used to compose the caption associated with the selected photo. Photo caption: body of the caption. Header: this text heads every caption. Ending: this text ends every caption. You can use the following html markups: b, i, u and br. You can also make use of the tags, which will be replaced by emoticons or EXIF or IPTC informations embedded in the photo. The resulting caption is previewed in real time under the display of its photo.